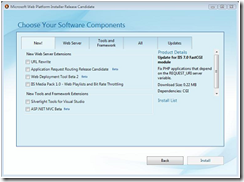 Yesterday Microsoft released Web Platform Installer (WPI) Release Candidate to the web at http://www.microsoft.com/web/channel/products/WebPlatformInstaller.aspx. Betas have been available for a while, but the release version contains several new features. This is a one-stop-shopping installer for free Microsoft web development software; everything you need in one place. On the web page, just click “install now” to get started. You can run the installer directly from this link; there’s no need to save it to disk. 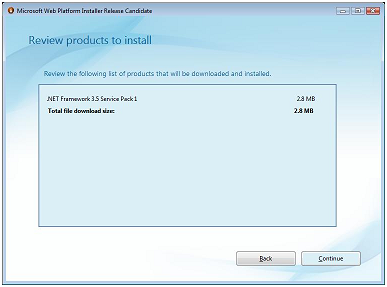 The installer itself is light-weight and its payload is always downloaded separately. The Welcome Screen provides three choices; install everything, install development tools, or let me pick a list of products to install. Selecting “Complete” presents the user with a long list of software to be installed, rolled up into categories. The itemized list would be much longer. Installed software is detected and skipped. The operating system and architecture are taken into account in constructing the list, making it dramatically simpler to choose what you need. Since you run WPI from the web, the versions offered are always the latest available. While these selections are quick and convenient, the real power of Web Platform Installer shows when you select the “Your Choice” option! Notice the five tabs at the top of the content; the default view is “New.” If you make a habit of coming back to WPI regularly, you’ll quickly see what’s been added recently. You’ll also see at a glance if you’ve already installed the latest versions of new offerings or not. Very handy. 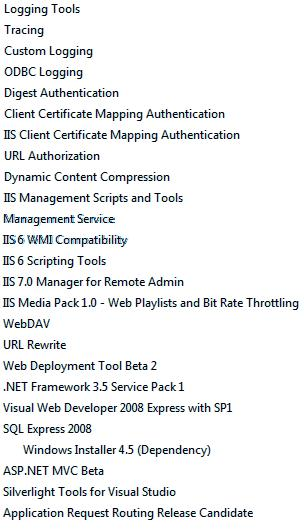 If you want to install software on your web server, click the next tab; “Web Server.” Depending on your OS, you’ll see IIS 6.0 or IIS 7.0 options. A dropdown lets you select the subset that fits your interests; classic ASP, PHP, or ASP.Net. Installed items are detected and indicated, only appropriate software is offered. Selecting an item automatically selects other items which are required for it to be installed. Incompatibilities on your machine are detected, and remedies are recommended. 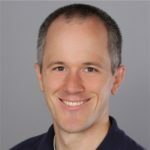 If you select “Tools and Framework” you get an itemized list similar to the top-level “ASP.Net Developer” selection, but you can slim your list if you like. Again, dependencies are detected, so if I select “SQL Express 2008,” “.NET Framework 3.5 SP1” and “Windows Installer 4.5” (not shown in this view) will be selected for me. The “All” tab presents a complete itemized list of the current capabilities of the Web Platform Installer for my machine. The view is not cluttered with items which do not apply to my OS or CPU. This is a handy way to take inventory, as well as get an accurate idea how my machine is currently configured. And finally, the “Updates” tab shows me available and appropriate updates. This is a great way to keep your machine up-to-date with releases that might not be available yet via Windows Update. 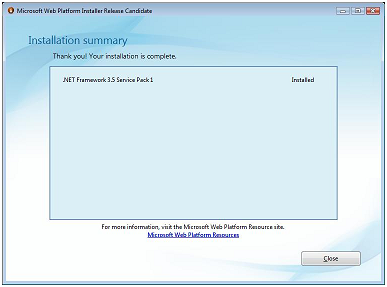 Let’s say I select “.NET Framework 3.5 Service Pack 1” and press the install button. I’m given an opportunity of review my selections (which may have been numerous) and am given an idea of the amount of disk space required. Next, I need to review and accept End User License Agreements, since WPI runs each installer silently. And finally, I get a nice installation UI, telling me the state of each product being installed and displaying a composite progress bar. Installation isn’t 100% unattended, because some items must reboot before continuing. After reboot and login, installation will continue automatically. Finally, you get a summary display listing any problems encountered during installation. The Web Platform Installer makes it simple to install the appropriate mix of software for your web server or development machine, without having to read numerous KB articles about which items to select for which platforms, operating systems, and architectures. It’s also designed to make staying up to date as simple as possible.